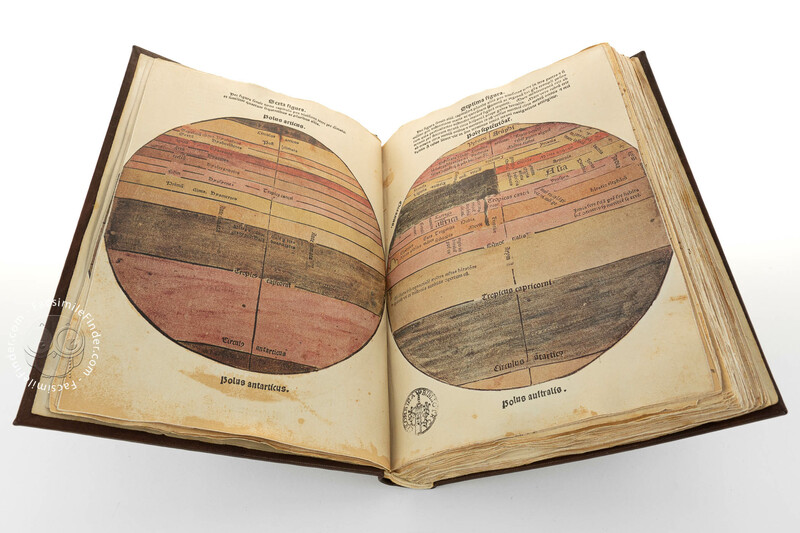 Written by Pierre d´Ailly, Chancellor of Paris University, and published in Leuven between 1480 and 1483, this work explains Ptolomy´s concept of the earth as a sphere, and is a compendium of the astronomy, cosmography andgeography of the time. Columbus used the book in the preperation of his voyages. This copy contains the manuscript annotations and is conserved in the Columbian and Chapter Library in Seville. Printed book on paper − 28 × 21 cm − 288 pp. Full-size color reproduction of the entire original document, Imago Mundi: the facsimile attempts to replicate the look-and-feel and physical features of the original document; pages are trimmed according to the original format; the binding might not be consistent with the current document binding. The facsimile and the two commentary volumes come in a gray velvet box. Leather in Mudejar style with studded gold plated.